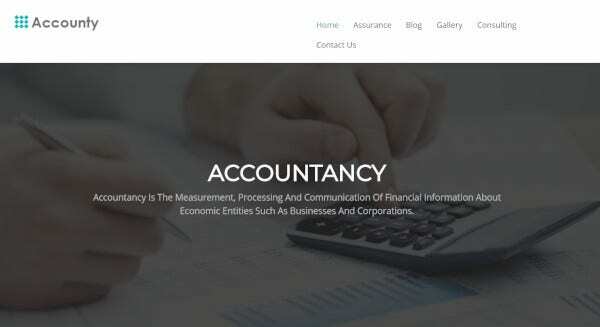 Every business needs a website of its own; tax consultation is one of the important businesses and has its own priority. In the era of WordPress theme and template, there is no big deal to design the own website on your own. So, for your convenience, some of the excellent WordPress themes are discussed below. Consultive is the business template is suitable for accountants firms, consulting firm, corporate websites, etc. this theme comes with features like slider revolution, advanced typography, installation on a click, detailed documentation, compatibility with child theme, etc. the theme is compatible and responsive for every device such as Smartphone’s and tablet. It’s SEO ready feature enables the user to create their own page not being a professional. Unlimited pages of the theme help in posting blogs, testimonials and other information in your profile. 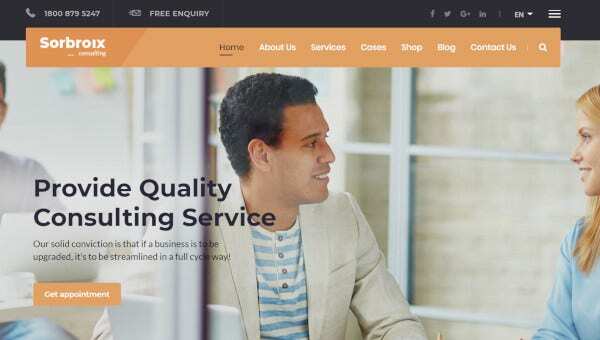 This WordPress theme is very helpful in creating your business website without any coding. The page builder and responsive layout features of the presentor theme make the content of the website and the website itself adaptable to every device and the device screen. The retina ready theme is enables the website to adapt retina screens appearing sharp. The user can update the contents and website information very easily as the theme is user-friendly. Xzofina is one of the best-featured themes will suit for consulting, marketing, business and digital agencies. The customizable features like availability of good documentation, page builder, trending theme designs enable the user to get the professional experience. Its responsive layout theme feature provides conveniences in every size of the screen for all the devices. Xzofina being a good business and marketing theme provides insurance, investment and consulting firms a corporate website. 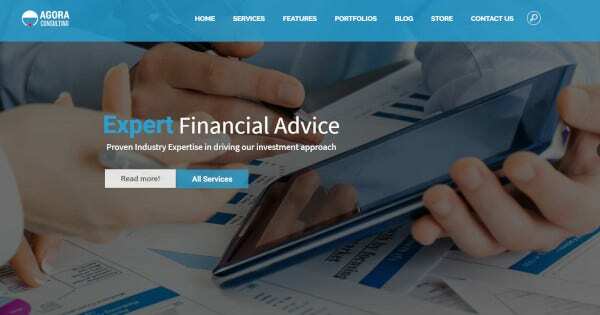 Investero is one of the attractive themes of WordPress provides a whole new user experience. Its SEO friendly plugins make the website more organized and user-friendly. Google fonts help in font design. Retina ready feature adapts retina ready screens for greater pixel density, and responsive layout makes the website adapt to screen size of any resolution. The user can also design e-commerce website by using the WooCommerce plugin. 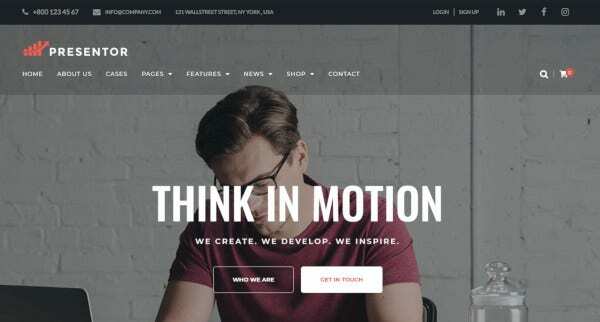 With different features and plugins, this is a great WordPress theme. Sorbroix business and marketing WordPress theme is very convenient for kind of startups and consulting firms. Using this theme for website creation is very easy as it has highly customizable features like data importer enables the user to update information in one click. With Redux theme feature of sorbroix that helps in configuring and modifying the different things in the website. Other options like slider revolution, availability of a number of colors and responsive layout are also useful. 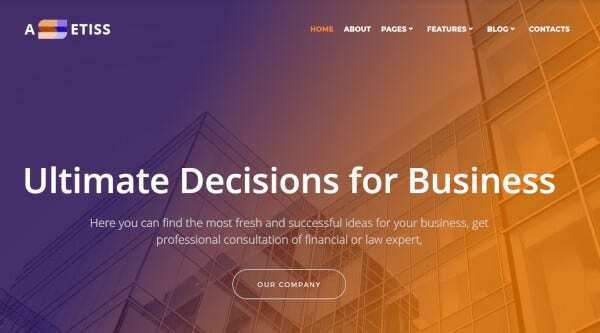 The features provided by an intigritz theme for your business firm, are enough to choose this WordPress theme for your business. It is a highly customizable theme appropriate for every business having retina ready feature along responsive layout. this WordPress theme enables you’re the website adopt any screen providing your clients a great experience whether they open your website on Smartphone, tablets or any other device. The elementor page builder is another feature of this theme to make your website better. Excitor theme is that business and marketing theme which is best suited for every kind of business related to consulting, investment, insurance, loan, tax etc. Responsive layout, trending designs and availability of various templates gives you an attractive and highly sofisticated looking website. The user does not have to be a developing professional to design his own website using the excitor theme. The built-in features available in this theme are user-friendly able to meet the need. Consultor is the business theme which is perfect for tax and consulting business. 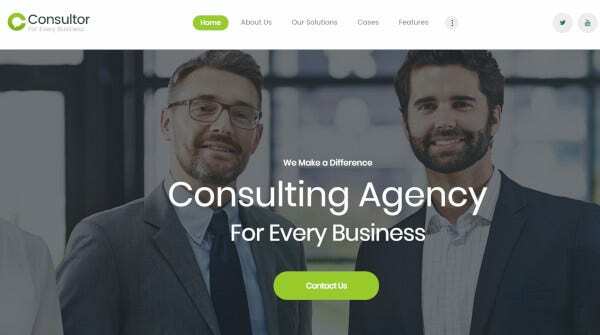 Consultor is that full-featured theme which has premium page builder, responsive layout, attractive gallery, separate layout for blogs and testimonials helps the user create the catchy website. With SEO friendly option, consultor theme makes the developing time lesser. Consultor has cross-browser compatibility which makes the website faster and responsive. This multipurpose business theme being very much user-friendly is the right choice for any corporate website. Assetiss is that theme which provides an adaptive user interface, along with Google font which helps you with font design. By using elementor, the user can custom page layout, blocks, add some new module or edit anything if needed. The SEO-friendly feature of the theme makes the page well-organized giving it a clear structure. Due to its layout responsive feature, it enables the website to adapt any device screen whether it is a tablet or a Smartphone. Account theme is business and marketing theme of WordPress and is a suitable choice for creating a professional website for your business. The plugins like WooCommerce help to create an e-commerce site for your business with 24*7 customer support. Another plugin slider helps you to increase traffic on your website as well as the stay time of the user. Other in-built features of account theme like responsive layout, page builder, Google fonts, installation on a single click and designed template lessen the developing time. Agora theme is one of the most suitable themes for businesses like accounting, financial consulting and stock trading. It has features like child theme, install on single click, page builder, retina ready, responsive layout, etc. make the website development hassle-free. Different WordPress plugins like WP Instagram. WooCommerce is free with agora theme. By installation of this theme for your business, you can make your website better and more attractive to the users. 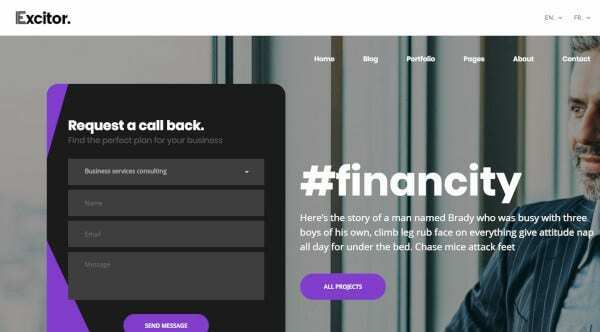 Creus WordPress theme is used for tax consulting business, marketing, accountancy firms, insurance firms, and other financial firms to make their website professionally designed. Creus theme is highly customizable as well as user-friendly for anyone who is not much technically equipped. 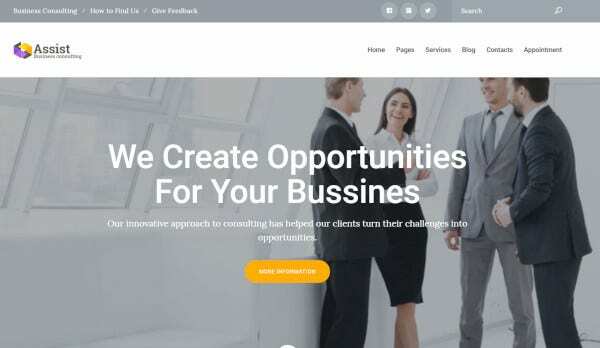 Anyone can create a website for their business using this theme as it has many features like page builder, responsive layout, retina ready, Google fonts, etc. different WordPress plugins are available with this theme for making the page more responsive and efficient. 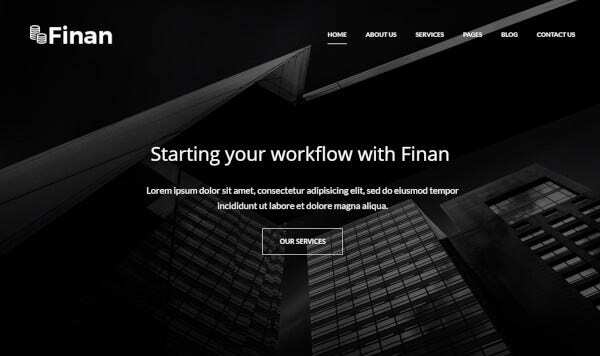 Finan theme is the business and marketing WordPress theme used by most tax consulting firms. The theme provides highly customizable features like responsive layout making the website adapt different device and screen resolution providing the users a great experience. Retina ready feature enables it to adapt retina ready screen for clarity; page builder is another useful feature of Finan WordPress theme. It also provides free WordPress plugins making the website faster and efficient. Anyone without much technical skill on developing can create a website using assist theme as this WordPress theme has page builder makes the website very responsive and adopt every screen type. A highly customizable feature of this theme enables the user to update information and changes if needed. Plugins like a slider, WooCommerce are very much useful for developing individuals. 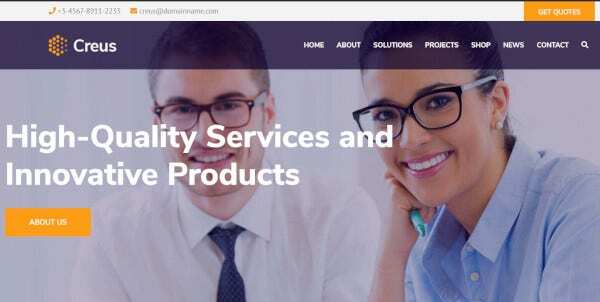 Other features of assist theme are a responsive layout, Google fonts, page builder and installation on single click makes it a better WordPress theme. 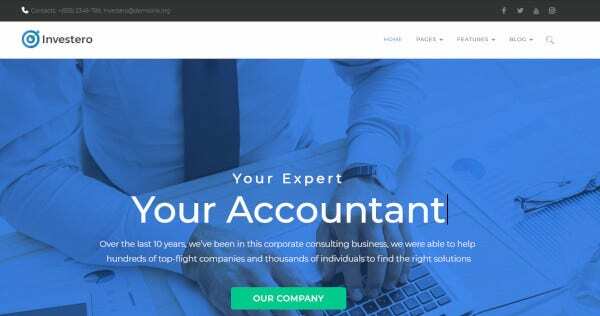 Tax Time is the multilingual WordPress theme used for business and marketing of tax consulting firms to create a better website which will be user-friendly as well as attractive. 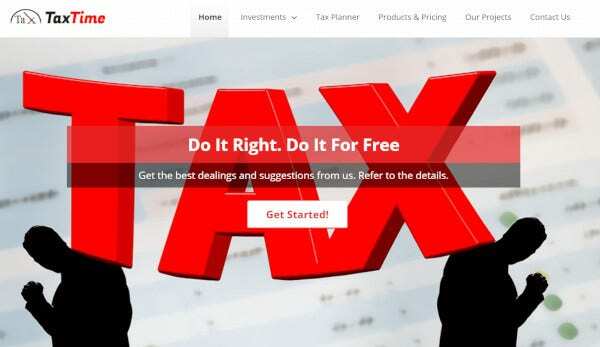 Tax Time has the features like page builder, retina ready, Google fonts, responsive layout, installation on a single click to make the developing process less time consuming and hassle-free. The website can be customized according to business need due to its easy customizable features. So, that user can update it from time to time. 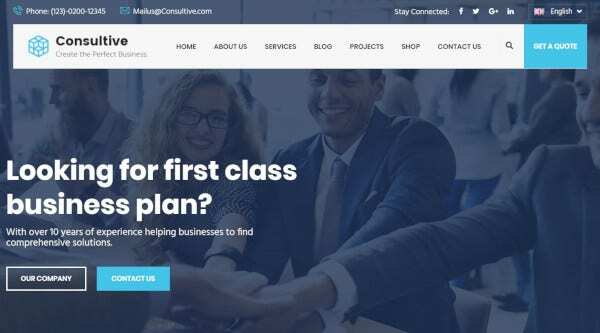 These above-mentioned WordPress themes are some the great themes you can use for your tax consulting business to get a professionally designed website. For this, you don’t have to pay a huge amount to your developer or hire an exclusive developer for this job. With the help of these themes, you can design your own website saving your money and time.